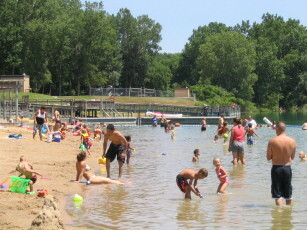 When it was constructed in 1993, Versluis Park in Grand Rapids, Michigan included a family-friendly picnic area and playground, as well as beautiful beach access for swimming and fishing. What it didn't yet include, however, was easy and equal access to all of these features for each of the park's visitors. Parks Director John Short recalls how a decade ago many visitors could not participate in the park's activities because of the lack of accessible paths to and around the beach and picnic areas. It became obvious to officials of Plainfield Charter Township that more easily accessible paths and structures could benefit not only neighbors with disabilities, but also young children, grandparents, and other members of visiting families. 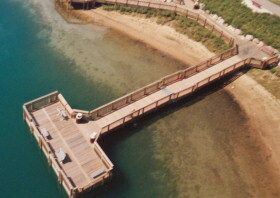 To create a beach area that was equally valuable to all of the lake's visitors, renovations were made at the parking lot and beach, an accessible playground and picnic area were added, and 1,200 feet of boardwalk and two fishing locations (including a 65 foot pier) can now boast access for everyone. The new and improved Versluis Park was revealed in March of 2000, and incorporates several inclusive elements that allow all individuals to enjoy the lake's shore. A wheelchair ramp and series of transfer stations run directly into the lake for wading and swimming. Picnic and fishing areas are also accessible to those using mobility devices. And, a personal favorite for the area's children, the playground was updated to be fully inclusive as well. According to Short, much thought was given to families including younger children during the design of the renovated park. "Versluis is unique in that it is not just a generic footprint of a kid park," he says, but a place where children and their families can play and participate in outdoor recreation together regardless of age or physical ability. To fund the renovation of Versluis Park, Short applied for and received a Michigan Natural Resources Trust Fund grant. Although this grant was initially intended to fund 70% of the project, some of the accessibility features were more expensive than first anticipated. The additional $100,000 in improvements was kept in the plan thanks to funding from Plainfield Charter Township, who provided a 50% match to the grant. "Most projects would just cut something from the design, but the township was committed to the park," Short said. 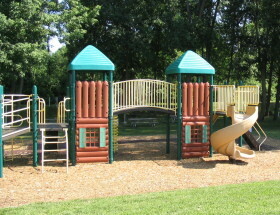 The planning and construction of the park's accessible design was a three-way partnership between the township, an architecture landscape company, and an accessibility consultant. To ensure that the facility would be universally accessible, an inclusive recreation consultant with Access Recreation Group visited frequently and made recommendations for improvement, as well as approved every aspect of the park upon completion. The changes to Versluis Park were well received, and now the beachfront has an average of 40,000 visitors during its summer season, every one of which can participate in the park's activities. This community enhancement has not gone unnoticed by local and state organizations. On October 21, 2005 Plainfield Charter Township and the Parks and Recreation Department were presented with a da Vinci Award from the Michigan chapter of the National MS Society for their work at Versluis Park. The da Vinci Awards recognize individuals, organizations, and corporations whose design innovations have exceeded legally mandated requirements, such as the ADA, to further empower people with disabilities. Versluis Park obviously exemplifies these qualities, allowing everyone who visits an enjoyable day at the beach with friends and family of all abilities. But those who are responsible for the park's improvements don't see their efforts as extraordinary, just as what should be done for all recreational facilities. "Every community that does a project like this needs to make the project 100% fully accessible and they should push everyone involved - vendors and designers - to make it fully inclusive, too," Short said. It is this philosophy that has transformed Versluis Park into a family environment that allows and encourages participation from everyone.